Currently, hand knitting using spokes becoming more and more popular. This is not surprising due to the possession of this art can create a great variety of different veshchichek. Moreover, it can be, as clothing, for different times of the year, and a variety of crafts. Learning to knit is not difficult, the main thing that it was to develop something new to this aspiration and desire. 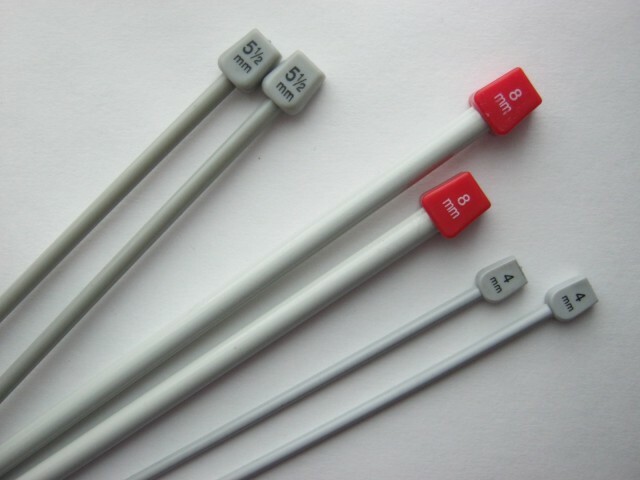 What tools are useful to buy knitting needles, and how to correctly choose? How to learn to understand and read circuit? What are the main types of hand knitting there? conventional needles. Such spokes are made of light materials. They are different in length and thickness. Use conventional needles can be virtually any knitting, except for the circular. It is very convenient to take the big picture provyazyvaniya spokes, having a tip at one end. The use of such spokes makes it possible not to worry, the hinges will fall from them, and come down. Knitting needles braids and plaits. 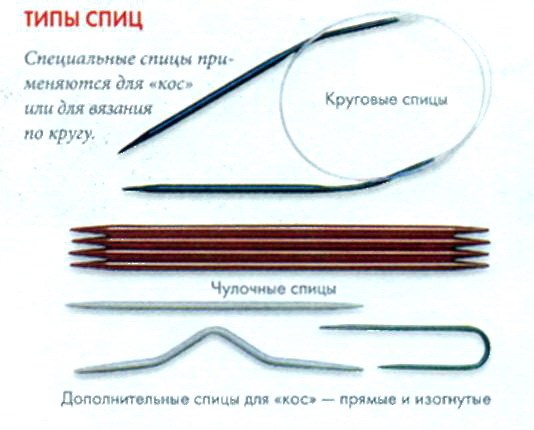 These needles are specially designed for such a knitting element, as "spit", but rather to facilitate the crossing loops at their provyazyvaniya. They have quite an unusual shape and look like an ordinary needle slightly arched in the middle. The size of these spokes is usually from 2,5 to 4 mm. circular needles. As well as they usually come with different diameter, but differ in their views. The length of circular knitting needles is usually not too big, and is attached to the tips of a special monofilament, plastic or metal. Most often they are used for knitting in a circle or webs with a large set of loops. Also thanks to the possibility of knitting in the forward and reverse direction, these needles are used in provyazyvaniya and some patterns for which you want to make two front or two backstitches series. hosiery needles. Such spokes should be included five stuff. They are used for knitting in a circle, and the creation of products such as socks, neck sweaters, raglan, dresses, šapoček, glove, mittens, etc.. The cloth is four spokes, and fifth purpose is to provyazyvaniya loops, located on one of the four main spokes. One of the advantages of stocking spokes is the ability to create a product without seams. Needle. This tool is necessary for stitching details. Usually uses a large needle with a large Gypsy eye, to thread the yarn is well held in her hole. Marking clip. This tool is designed to control the number of loops and rows, as well as for cases, when you want to mark a location on knitted cloth. Pin. it is necessary, when a certain number of loops nuzhnoo leave not knit, To do this, selected loops are temporarily thrown on a pin. Pin must be large, not less 10 cm. Very important is the ability to choose the right yarn and needles size for future product, since this factor directly affects the quality of knitting and future results. All kinds of spokes, regardless of their destination has its own number and very well, if it is marked not only on the packaging, but on most spoke, in order to avoid confusion later. Needles number denotes the size of its diameter. In total there are more than ten spokes rooms. According to the generally accepted rules of the spoke to be twice as thick, than the selected knitting yarn. But in fact, the thickness of spokes is better to choose for each individual, since the machines and knitting density of all its own. For those needlewomen, which have a more free style knitting stitches, better to buy needles with a diameter of 1,5 times thicker, than the thread, and who likes to knit tightly, Yarn should be 2,5 times thinner spokes. For knitting gum, in order to make it as flexible and elastic, it is also desirable to take the needles with the same diameter as the thread, or only 1,5 times thicker. In this way, If you want to associate light summer or the delicate little things, the best fit fine needles with numbers 1 and 2; for more dense items and threads, created a few additions, excellent option could be the spokes with a diameter of 2,5 -3. 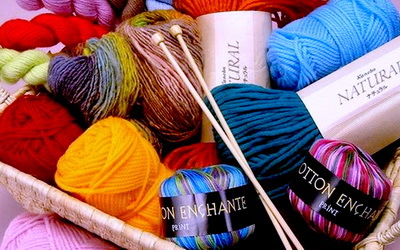 Starting with the third issue, needles for knitting are taken solid and bulk items, generated from the thick filaments. These needles can create a pull-overs, jackets, hats, bags and even jackets and coats. Cotton. This yarn can be attributed absolutely any pattern, and at the same time he received an unusually beautiful. Mohair is a fluffy yarn, made of wool. Such yarn knitted warm winter clothes. novelty yarn. This yarn is also known Melange. It includes part of the natural and man-made fibers. Usually, it has a different texture, eg, boucle or shishechki. brilliant. This yarn is a mixture of a core yarn, acrylic and viscose. Fancy yarns. This thread is obtained by mixing fibers of different not only in color, but also in quality and made by special technology. Wool. Made from sheep's wool. Ideal for smooth, relief and multicolored patterns. Spokes best to take light, so that the hands do not get tired of their severity. They money had to be no roughness. Select the thread you need to very carefully. Very important, that it has a solid color, otherwise related stuff will fade. Also important thread feature is its elasticity, quality and durable yarn allow product to serve much longer and will not let him be deformed. Quite often it happens, that tangle thread has irregularities, that is, at different sites have different diameters. Such a defect threatens to make knitted fabric sloppy and ugly, so this yarn can be used only for products with a relief pattern, to smooth out its deficiencies and turn into advantages. The tips of the needles should not be too sharp, so as not to prick them, nor too blunt. Otherwise the knitting process may be your real flour. In the first case, you can simply wounded hand, and the second needle is very difficult to pick up the loop. When choosing spokes should also pay attention to the material of their manufacture. So, eg, bamboo knitting needles are very handy, but their life is quite small, due to their frailty, aluminum spokes should not be used to create luminous things, as they may leave dark stains on them, Steel also spoke a bit heavy, but otherwise considered almost ideal. Do not take the yarn for knitting with a highly twisted yarns, since they are in any case contribute to the deformation pattern of the product and. In order to properly calculate the amount of yarn needed for future product, in addition to the model and size of the product should be considered drawing, selected for it, the tighter binding, the more material will be needed. The amount of yarn required is not determined by the number of coils, and its weight, since different firms and coils is not the same footage. Footage of the thread is written on the label and is often denoted by number, indicating the number of meters of yarn per gram of its weight. The smaller number, the thicker the thread. If the label on a fractional number is indicated, the number indicates the yarn diameter and number of strands of yarn, from which it is twisted. For greater reliability, better to take a little more yarn, than you have calculated for the selected product. 1 main way. Hinges are typed on two spokes, this is done, so that when they are not set too pulled together, and one easily could vyvyazyvayut new tabs. The spokes are placed in the left hand, and held just above their start with three fingers: big, the index and middle. Thread jumped on the thumb and index finger of his left hand in such a way, to its end lying on the index finger and went into the palm, and the other end, extending from the coil, swathes of the thumb and also went into the palm. The tips of the thread lightly adhere the remaining fingers of the hand. After correct positioning, the spokes are threaded under the first thread, located on the index finger, and then at the end of, draped on the thumb. Then the needles being moved towards the index finger and cling, thread located thereon via first directional movement up and then down and then the spokes are threaded with the thread again into the loop, formed on the thumb. At the end of the first loop knitting yarn is removed from the fingers and loop, formed on the spokes tightened. In order to make the second and all the other loop, thread again placed on the thumb and forefinger, and in the same way, as for the first loops repeat all steps. Once the required number of loops will knit, one of the spokes neatly removed from the loop. 2 way of. Spokes as in the first method,, must be placed in the right hand, whereupon the working thread jumped on the index finger of the left hand and the needles and removed poddevat formed on the finger tab. Then thread, extending from the coil is pulled until, as it will smooth, but not too tightly laced Collar. 1)For knitting facial loops free spoke plant in the middle of the loops and pulled her working thread, in this way, A new loop is formed. 2)Purl loops is knitted as follows. Free needle is put through the wall loops from left to right, then before this loop throws a working thread and is pulled through the loop from left to right movement spoke. Besides, by means of alternating right and wrong loops can perform various kinds of patterns, the simplest of which are squares and rhombuses, and for more complex graphics, and breedings invented various schemes, learning to read that, you can set up any favorite thing. For a conventional rectangular blade, where knitting is carried out from two sides, start circuit is below, and its analysis should be done alternately in one direction, or the other. For personal series from right to left, and for backstitches left. Disassemble all the schemes best before knitting, so as not to obscure points left in them. Wrong (izn.p) – sign in form in the middle crossed white square " ". front (LP) - sign in the form of a black square ","
Nakid(n) - the sign "^". The first two tabs, starting from the front edge provyazyvayutsya, if the front side, or purl on wrong side. Then knit loop, make a copy of the spokes on the needle and returns to the rest of the loops. Then, the two loops must be knit together again and throw a new loop on the left needle. In this way, provyazyvaniya the loop continues until, while on the left spokes will not remain a loop, which must be secured with a hook, for this hook is threaded in a loop, then he caught a working thread and protyagtvaetsya through the last loop of a number of. Then the thread is cut, and the resulting loop is delayed until the knot. 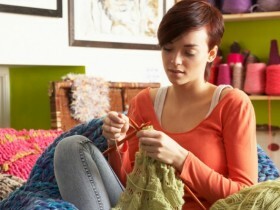 Once you have fully mastered the necessary information and basic techniques of knitting, stocked with the necessary tools and materials, you can safely proceed to create and start to dress yourself and your loved ones in a beautiful knitted little things, by their own hands.